In terms of the toys we care about, Mattel has absolutely turned itself around this year. Sure, their JLU line won the 2005 Best Line ToY Award, but it wasn't that long ago their Batman line was dying a slow and pathetic death, drowning in a sea of bad business decisions. But when the line died, it changed. The scope expanded, and it became DC Superheroes, the best line of 2006. There was an immediate difference, with more villains and more respect for the supporting characters. Supporting characters like Batman's one-time assistant, Batgirl. Batgirl is Barbara Gordon, daughter of Gotham City police commissioner James Gordon, who first became Batgirl to save her father from criminals. But the library sciences major found she possessed a talent for the job and over time became a trusted ally of Batman. Fully aware of the dangers of her double life, Barbara believes the good she does as Batgirl outweighs the risk to herself and her father. This particular Batgirl is only available in a two-pack with Batman, which proves that Mattel isn't the #1 company in the industry yet - they're still clinging to that old notion that girls don't sell. The Batman in the set is the same as the one in DCSH Series 3. It's a very nice figure, true, but if you already bought it, then Mattel has just forced you to double up if you want Babs. That's a pretty low move on their part. At least if the set came with all seven Batarangs that the single-carded figure had, we could tell you this set would make a great alternative if you haven't found him yet. Sorry, nope. Batgirl is a great figure by herself. At 6⅛" tall, she's the same size as Supergirl, which might be just a little too big. Of course, Babs was a college student by the time she became Batgirl, so she should have reached her final height by now. Also, her boots have thicker heels, giving her a little lift. She looks fine next to the other DC Superheroes. This figure was sculpted by the Four Horsemen, so there are no problems there. The legs may be a little long, but that just gives her a Neal Adams vibe. Her utility belt is the capsule style, rather than pouches, but it looks like real nylon and the bat symbol belt buckle is raised. The bat symbol on her chest isn't sculpted in, so we may be seeing more of this body. Her hair is especially good, and her gloves and boots have small details that make them look like real leather clothes. Her cape is solid plastic, but it's molded to look like folded, draping cloth. Articulation is good as well. Batgirl moves at the ankles, knees, thighs, hips (those combo joints that have the range of a balljoint), waist, torso, gloves, elbows, biceps, shoulders and neck. The neck and waist are both limited (by hair and belt, respectively), and a swivel below the knee would be nice, but not necessary. There have been some complaints that Hasbro's Marvel Legends will be losing articulation, but Mattel has shown that you can still have a really nice amount of movement without getting into current ML levels. 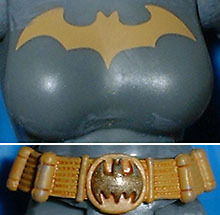 Batgirl has one accessory - the set's sole batarang. 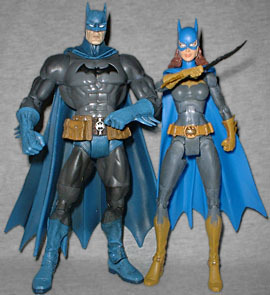 It's reused from the good Batman figure, but Batgirl holds it much better. In fact, odds are she can hold the rest of them better, too. Instead of a small notch in her glove, Batgirl has her fingers ready to clutch the batarang. The figure's paint apps are simple, but they work. Overall she's a bit lighter than Batman - lighter gray suit, lighter blue cowl, lighter yellow belt. Her hair is a rusty red, and her skin is a healthier shade of pink than Bruce's, too. Mattel is slowly learning the way the toy world works, now that they have to worry about collectors as well as kids. 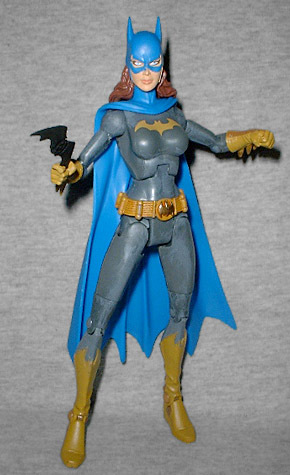 The Four Horsemen created a truly excellent Batgirl figure for them, but Mattel almost blew it by releasing her only in a two-pack. The Batman in this set is great, if you don't already have him. If you do, well, customize him or something - it's worth having a superfluous Batman to get this Batgirl.